"The People’s Republic of China and the Russian Federation are already flight-testing high-speed maneuvering weapons (HSMWs) that may endanger both forward deployed U.S. forces and even the continental United States itself," an executive summary of the report says. "These weapons appear to operate in regimes of speed and altitude, with maneuverability that could frustrate existing missile defense constructs and weapon capabilities." 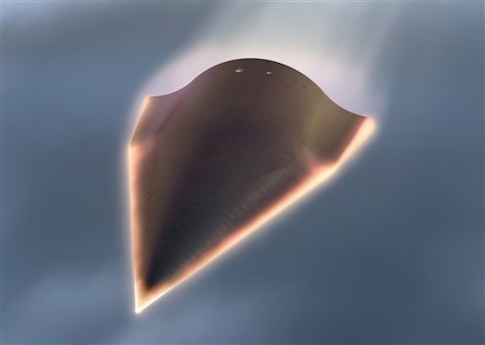 Hypersonic missiles are ultra-high speed weapons that travel along the edge of the earth's atmosphere at speeds above Mach 5, or five times the speed of sound. The missiles also can maneuver to avoid current missile defenses—all of which were developed to hit ballistic missiles with predictable flight paths. The unclassified summary of the report, "A Threat to America's Global Vigilance, Reach, and Power: High-Speed, Maneuvering Weapons," was produced by a blue-ribbon panel of experts for Air Force Studies Board at the National Academies of Science. The summary was made public earlier this month. It is the first U.S. military study to sound the alarm about an arms race quietly underway for several years to develop hypersonic missiles for both strategic nuclear weapons and conventional rapid strike systems. Mark J. Lewis, chairman of the panel that produced the report, said the panel concluded that as a result of new hypersonic missiles from Russia and China "the United States may be facing a threat from a new class of weapons that will effectively combine speed, maneuverability, and altitude in ways that could challenge this nation’s tenets of global vigilance, reach, and power." "Offense and defense are two sides of the same coin; as in the days of the Cold War, the only reliable deterrent to the use of a hypersonic weapon may in fact be the threat of a corresponding hypersonic countermeasure that might hold at risk the very sites from which the adversaries’ hypersonic strike would originate," Lewis stated in a forward to the summary. Lewis urged the U.S. government to engage in a major effort to develop both offensive and defensive means to counter high-speed maneuvering weapons. He criticized what he termed the "relatively leisurely pace of disjointed hypersonics technology development" by the Pentagon. Additionally, foreign nuclear powers are already designing systems that exploit both the organizational disconnects and current technical limits of U.S. defenses, he said. Air Combat Command, "Defense Against High Speed Weapons Operational Perspective"
According to the study, the new class of high-speed maneuvering weapons operate "at the seams" of U.S. defense and national security systems that make them difficult to counter if the weapons are used against U.S. forces or American territory. "Put another way, while operational doctrine and command structures adequately address traditional atmospheric air attack or exoatmospheric ballistic missile attack, existing doctrine and organizational structure may not be adequate to address the cross-domain threat posed by [high-speed maneuvering weapons]," the report says. The report says that some may seek to dismiss the new threat as overblown or non-existent and similar to the Eisenhower-era ballistic missile gap because it has taken decades for the hypersonic missile threat to emerge. Also, some security analysts say the danger can be mitigated by a "silver bullet" solution, or that the threat will never fully emerge. "However, the value of extreme speed coupled with maneuverability and altitude constitutes a potential threat to U.S. capabilities that should not be discounted or ignored," the report warns. In addition to China and Russia, other states are studying hypersonic weapons, including India. However, China's multiple tests of a hypersonic glide vehicle dubbed DF-ZF appear to be the more advanced program. The most recent test took place in April. A Russian official announced in August that developing hypersonic missiles to defeat U.S. missile defenses is a high priority and that the first weapons could be fielded by 2020. Russia flight-tested its experimental Yu-71 hypersonic glider in April atop a SS-19 missile. The Pentagon currently has no well-resourced program to either developing hypersonic missiles or to counter them. Congress has sought to prod the Missile Defense Agency into focusing more resources on hypersonic missiles. The defense contractor Lockheed Martin is studying an enhanced version of the Terminal High-Altitude Area Defense known as THAAD-ER, as a possible defense against hypersonic missiles. The Air Force study said the combination of high-speeds and maneuverability increases the lethality of missiles that can be used to widen the range of attack options, and the missiles operate both within the atmosphere and in space in ways that make them much less vulnerable of conventional ballistic and cruise missile defenses. Two methods for reaching hypersonic speeds are through missile-powered gliders and rocket, ramjet, or scramjet powered versions. Such missiles also can conduct precision strikes at ultra-high speeds that the report says could include fixed or slow-moving targets such as runways, command and control facilities, or ships at sea. "Both categories of high-speed weapons may be capable of carrying conventional or nuclear warheads, thereby complicating strategic intent and posture as well as operational identification, response, and engagement," the report said. For those that have sought to play down the hypersonic threat, the report warned that "this is no mere tweaking of an existing threat." The committee said it was unable to find any formal strategic operational concept or organizational sense of urgency regarding hypersonic weapons, and faulted what the report called a "lack of leadership coordination" at the Pentagon in seeking countermeasures. An Air Force spokesman said in a statement that hypersonics are "one of the game-changers that provides high-speed options for engaging time-sensitive targets." "The Air Force is developing technologies for a high speed strike weapon to enable a responsive, long-range strike capability," said Capt. Michael Hertzog, the spokesman. "These weapons can be employed from fighters and bombers and fly at hypersonic speeds to their intended target on the ground." The Air Force is developing what it calls a high-speed strike weapon that will travel at hypersonic speeds. The technology involved in the program includes work on explosives with increased effectiveness in the high temperatures produce by hypersonic speed. Other technology involves smaller warheads, advanced materials for lower weight and cost, precision navigation and control, and solid rocket motor technologies to boost performance for air-launched missiles. The experts on the Air Force study panel included missile specialists from Raytheon, Lockheed, and Boeing, several former Pentagon weapons developers, and Adm. Richard Mies, former commander of the U.S. Strategic Command.